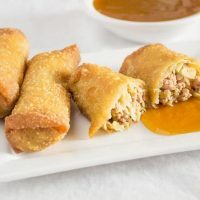 Recipe for homemade pork and cabbage filled Egg Rolls, Chicago Chinatown, Cantonese style with a hint of peanut butter in the filling. Served with peach and apricot flavored sweet and sour sauce. Egg rolls are my downfall in life. They are like potato chips, I can’t eat just one. Growing up an hours drive from Chicago we grew up eating at Chiam’s in Chinatown. It is no longer in business which meant no more egg rolls from Chiam’s. Eventually, we started going to Rising Sun in Mokena, it was closer and we could do carry out orders. But when we moved to Florida we were in for a rude awakening. Chinese food was all the same at all locations (and it wasn’t delicious). It is a phenomenon that has plagued us since. The need for a good egg roll that reminded us of Chiam’s or even Rising Sun was nowhere to be found, so the experimenting started. You may not like these, and it won’t hurt my feelings. Egg roll preferences are a very personal thing. Most people like the ones made in their area of the country and some like the generic version you get at most Chinese restaurant today that taste the same at all locations. We actually have 2 versions in our family now. Mine, the one that feeds a small army (OK, maybe a mid-sized army) and the quicker weeknight version Ron and Sam created in their kitchen. *Edit – we now have another version on this site called Easier Egg Rolls. That one uses Char Sui seasoning for a Chinese BBQ pork flavored filling. I also make a homemade sweet and sour dipping sauce. This reminds us of the light orange colored sauce served in the area we grew up in. Again, this one you may or may not like. Andy despises any sweet and sour sauce with ketchup in it so I make this sauce as it’s his favorite. No bottled stuff here, but if you have one you like, I won’t judge you for using it. If Andy would eat it, trust me I would be using it too. This recipe does make a ton of egg rolls, but they freeze well, after cooking. I reheat them in a 400° oven, turning often until skins are re-crisped. 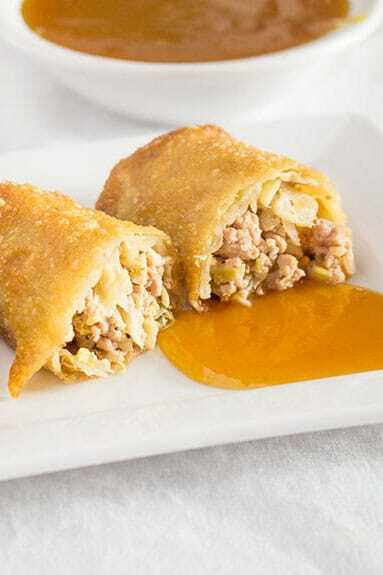 Recipe for homemade pork and cabbage filled egg rolls, Chicago Chinatown, Cantonese style. Cut pork roast into 2 inch pieces and put as many as will fit into a food processor and process until coarsely chopped. Skip this step if using ground pork. Set aside. Vegetables can be chopped in a food processor, just be careful not to chop too finely. You will want to be able to identify what it is in the final product. Put the pork pieces in a large skillet, lightly dust the pork with garlic powder and lemon pepper. Add a splash of soy sauce. Cook over medium high heat until fully cooked. Pour into a strainer and leave it there to drain and cool. In the same skillet add enough cooking oil to lightly cover the bottom of the skillet. Add the green onions, a sprinkling of garlic powder, lemon pepper. Dump this into the strainer with the pork. Repeat the process with the cabbages. When the cooked ingredients are cool enough to handle, squeeze out as much liquid as possible and add to a container large enough to hold all the ingredients. Add the bean sprouts, water chestnuts, and bamboo shoots. Mix until well combined. Heat peanut butter in the microwave for 15 to 30 seconds. Pour ½ of a cup into the filling mixture and mix well. Taste and add additional soy sauce, lemon pepper, and/or peanut butter to taste. Fill wrappers with filling and deep fry in hot oil until golden brown. Serve with dipping sauce. Combine everything except the water in a food processor or blender and process until no large lumps of fruit remain. Can be served warm, cold, or at room temperature. 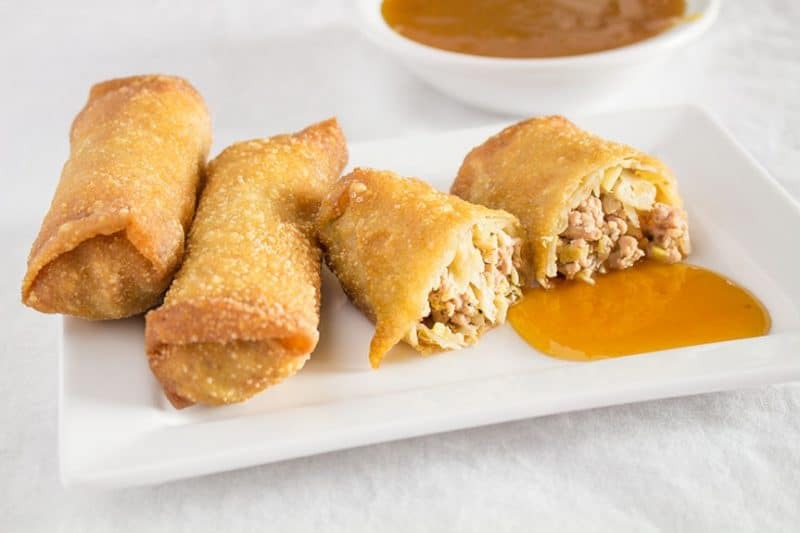 Nutrition will vary based on oil temperature and exact amount of filling used per egg roll. Sweet and sour sauce included in nutrition. These turned out really good. The filling is good over rice too. I was surprised how well these froze and reheated in the oven.